Tuesday at the Gwinnett Quilt Guild, Edyta Sitar of Laundry Basket Quilts was the speaker. She was wonderful. She brought a boatload of her quilts to show and discuss. 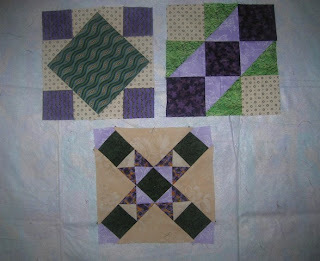 Her designs were awesome-teeny, tiny blocks and applique that made me want to do it! She also is a fabric designer for Moda Fabrics. 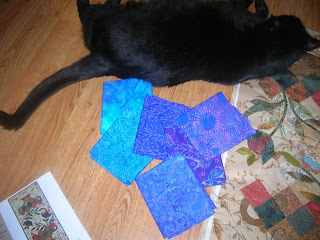 Her books and patterns are great. On Wednesday I had the opportunity to attend her workshop in Cartersville. We did a tablerunner that was recently shown in Quiltmaker magazine. See that applique? Yup-I did that!! It is raw edge applique. By the end of the day, I had half of the applique stitched. 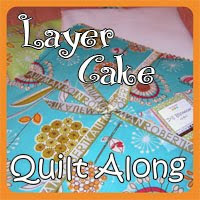 I am anxious to try the quilting technique that she demonstrated as well. 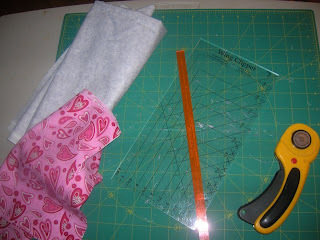 Since the table runner is small, I think I just might be able to do it! I treated myself to some of her fabric for my birthday. Such pretty purples!! I am a pushover for purple anyway. Not sure how Spooky feels about purple. I had never been to Cartersville before. It is a cute little sleepy southern town complete with the prerequisite pawn shops! I don't remmeber pawn shops in NY but there are lots of them down here! Many years ago, I became involved in a renewal movement, Episcopal Cursillo. 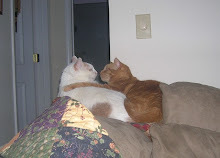 I remained involved until I moved to Ga. It was a wonderful experience. NY Cursillo will soon have its 100th weekend. A celebration is being planned in the fall and my friend Kathy asked if I would contribute a quilt for the event... This weekend I put the top together. 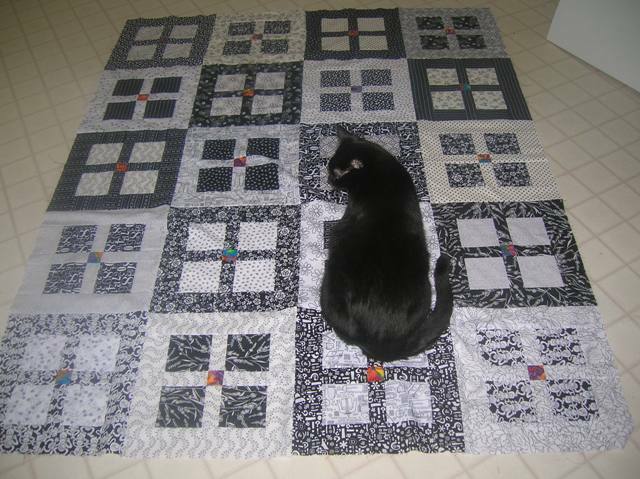 The quilt will NOT be donated with the cat. He stays here! It was a fun quilt to make. 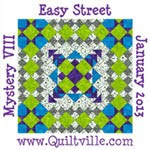 Queen Thimble also provided step 2 of her new mystery, Spot On! I have chosen to do my version in hot pink and gray. 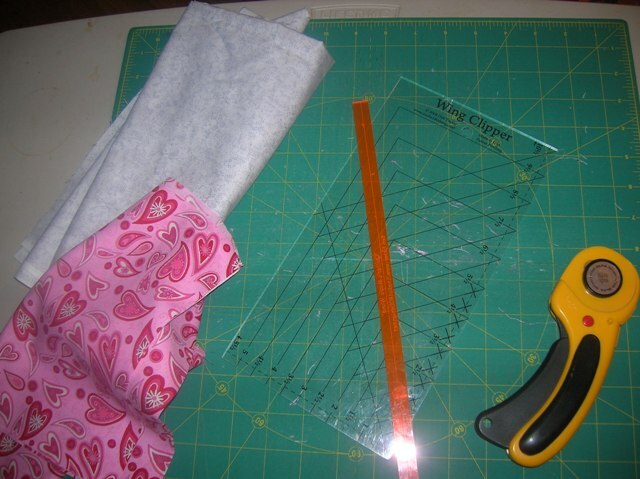 I needed to use my Deb Tucker tools for this step: the Magic Wand and the Wing Clipper. Now all my friends know about me and the magic wand-that I have several in various colors. (if one is good, then 2 is better, etc.!) And if you are making flying geese the Wing Clipper is a MUST. I only have one of those. 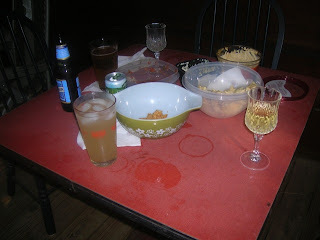 Yesterday evening I was watching another rerun of The big Bang Theory (one of my favorite shows-that an NCIS). At any rate, Walowitz had to pick up his mother at water aerobics and was talking about giggling arms. He would be in overload if he were to pop in this morning at the aquatic center at Mountain Park. Two sessions are combined in the summer to accomodate little people swimming lessons. As a result, the pool is pretty much packed with old people and giggling arms and other body parts. It made me laugh. I got to water aerobics early this morning. I was sitting in my car looking at the dollar bills Now I know that the various reserve banks and mints are marked on the bills. I had a "D" and a "J". I was trying to read what site those letter denote. Now I have to google it becasue there was no way that I could read that tiny print. After aerobics, we were walking back to our cars. Sharon misplaced hers. The parking lot is not that big but she did not park in her usual spot. I mentioned to one of the ladies that I do not let the baggers at Publix take my stuff to the car, mainly becasue I don't want to embarass myself looking for it! Someone told me when you park you should look at the sign on the building and that way you will know where the car is. This does not always work either. So now I am going to Goggle the mint sites. 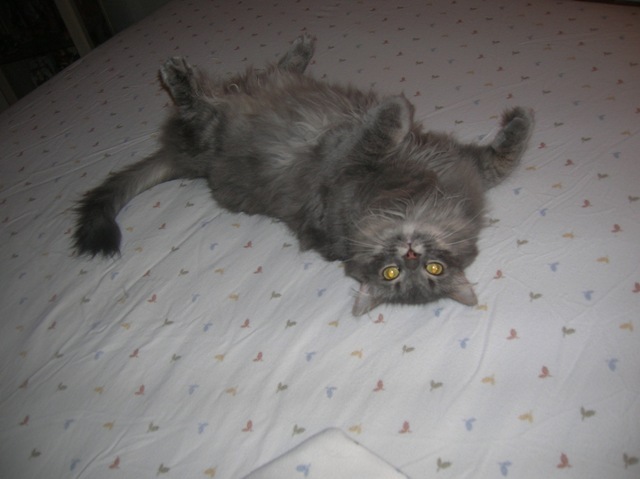 As for the picture of Wild Willie. I forgot why I posted it!! Each Saturday for the last million and a half weeks there has been a block published for the Grandmother's Choice block of the week. This thing almost got the best of me. By today I was 2 weeks behind and another new block on the site this morning. The two prior weeks were relatively easy blocks and I was not worried. 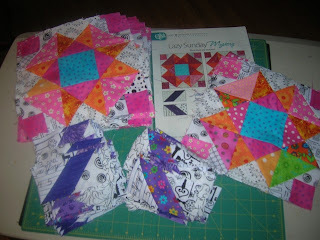 Today is the day that I got it caught up and it is a good thing because block #43 is a doozy! Some of my points are not quite but I am okay with it. I am not sure why Mr. Wild Willie is posing. He is just chillaxing in the kitchen. My guess is that he is waiting to see if some food will magically appear. I do love a mystery! And we all know what a Bonnie Hunter groupie I am. I thought that this quilt would be a companion to my Easy Street but I think the pink makes it pop too much. 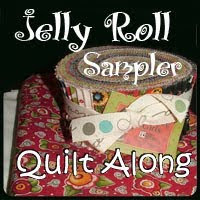 So maybe this one will go along with my other mystery quilt in progress. I am doing Pat Wys's Spot On! in light gray and hot pink. It seems that I am in a "bright period". 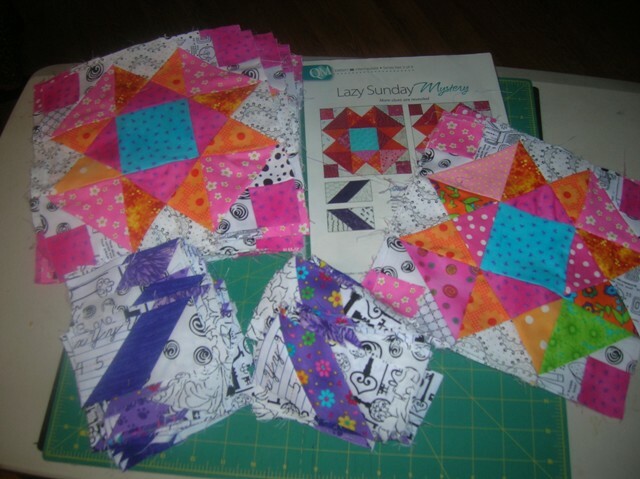 On the "to-do" list for the weekend are 2 blocks for block of the week and a replacement for a missing piece of Blogger Girls block. It will probably turn up after I make the new one. I think I also need to make one more block for that project. 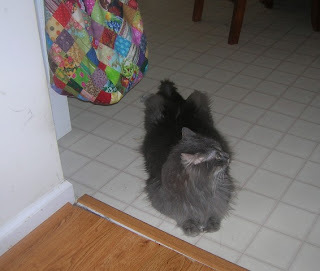 So much for cleaning up the sewing room. BUT I REALLY need to tackle that project-and soon. What is better than a bunch of quilters in the woods and Happy Hour? We had lots of good food came back home with us). Lots of snacks and goodies. North Georgia wilderness. This is the view from Brenda's cabin somwhere northeast of Blue Ridge. My goodness the drive up the mountain was take your breath away and thank goodness I was not the one driving! I am going to call this quilt 26 minutes til happy hour. 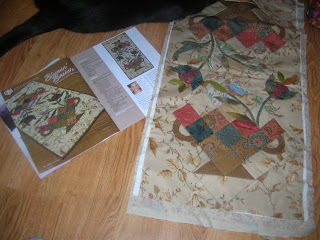 This quilt will eventually live in Florida once I make a backing and get it quilted. 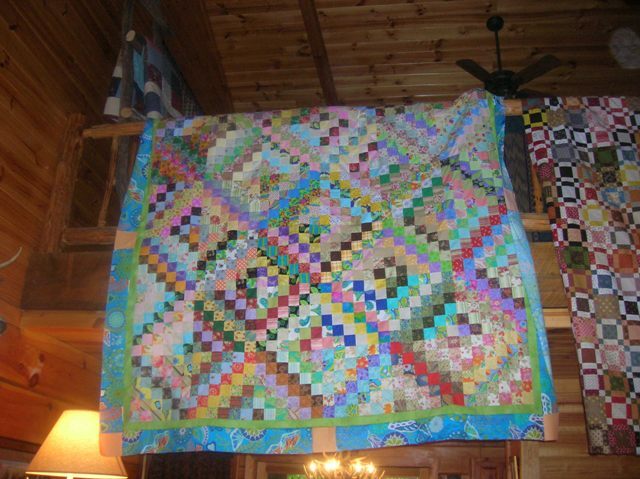 Brenda's quilt is also draped over the loft railing. It is spectacular-all shirtings and reproduction fabric. 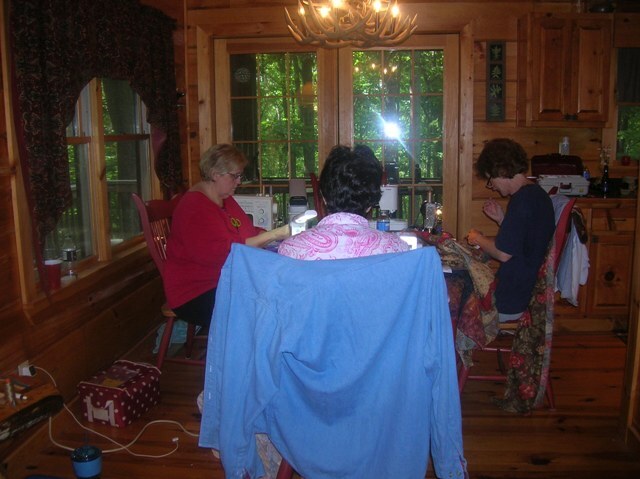 Busy quilters-what a wonderful hideaway. 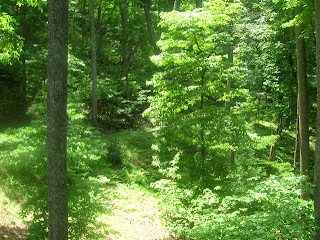 Brenda's land backs up on a national forest. Becky is busy working on a mystery quilt and there is Pat, always on the ball! Gotta luv these peeps.